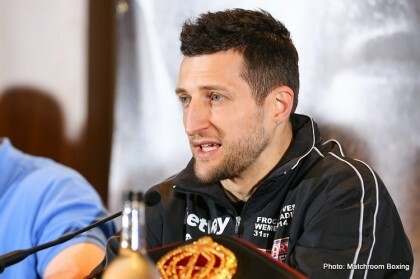 After they both made weight ahead of their headlining clash tonight, Carl Froch – enjoying his new punditry role with Sky Sports – has offered his opinion on Kell Brook’s IBF title defence against Frankie Gavin – insisting that the Sheffield welterweight will have too much for the Birmingham man. He said today at the weigh in that Brook “is a tough, tough kid” – something he knows first hand from sparring with him. Froch is with the vast majority who think that Gavin – despite his fantastic amateur pedigree – will not have the power to trouble the champion and get his respect – despite his skills as a pure boxer. Brook is already being linked to future fights with the likes of Keith Thurman, Tim Bradley and Brandon Rios – as well as being in the frame for the Mayweather sweepstakes himself in September alongside Brit rival Amir Khan. Potentially a very dangerous thing to do is plan ahead – although Brook himself insists he is not looking past Gavin, yet expects to beat him comfortably.